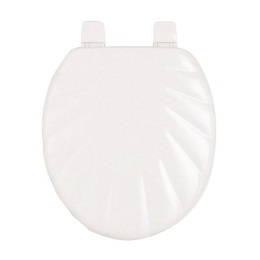 Add a touch of elegance to your bathroom with the Bemis White Shell Sculptured Toilet Seat, which will have the space looking refined, clean and bright once installed on your toilet. This beautiful design is constructed to look like a seashell with deep ribs running from the outer edge of the lid toward the centre. Seashells have been used as decorative elements since the times of the Ancient Greeks and Romans, making this toilet seat a piece with truly timeless beauty. Use it to put the perfect finishing touches on a nautical or seashore-themed bathroom or just to embellish the look of a bathroom with a contemporary vibe. The Bemis White Shell Sculptured Toilet Seat is constructed out of moulded wood and has an antibacterial coating to make it very hygienic. The seat itself is smooth and designed for comfort. Suitable for use on nearly all types of toilets, the seat is outfitted with universal hinges crafted out of durable plastic. Highly durable for daily use in a master bathroom, the toilet seat measures 370 millimetres by 440 millimetres in size. Order one now to get this gorgeous look in your home and perfectly complete the decor of your bathroom.